My audience is going to get divided here. Some of you are outdoorsy, meat eating country folk. Some of you are vegan. Some of you fall somewhere in between. For my non-meat eating constituents, please read on (if you haven’t stopped already), there’s a bigger story here about an accidental experiment, and the lessons it taught me. For the record, I am not a fan of killing animals (I ate a vegan diet for an extended period, but got away from it for a plethora of reasons that are beyond this post). I have absolutely no issue with folks who hunt (legally), it’s just not for me. I do currently eat meat, however, and I find that a tad hypocritical. It bothers me to think that I don’t want to kill an animal myself, but I have no issue eating one if all of the dirty work has been done for me. The fact is that we are removed from our food sources in modern society. We usually don’t buy packaged hamburger and think, “this used to be a cow”. Many don’t have the stomach to even think of the slaughter/butcher process, let alone perform it. But we have the stomach to eat it, because we can at least pretend to be blissfully unaware of where it really came from. When I got my camper parked in its winter home, I was graced with a booming red squirrel population. They ran all around, bouncing on my roof, squeaking incessantly at each other. I was pretty sure they were going to pose a problem. I wondered if they would calm down after mating season and leave me alone. Then I heard the chewing. I was aware of the damage squirrels could do. Over the years, they had destroyed a number of items I had stored in a small barn. But this camper is my home. They could easily get inside and nest, or destroy my electrical system, and otherwise drive me right out. I tried a product called Repels-All. It seemed to have no effect. It smelled awful – it repelled ME more then the rodents. I knew I could possibly live trap them and relocate them. I’m not sure if my city ordinance would allow it, but I couldn’t afford those traps anyway. Plus, I worried about taking them away from their nest, and all of the food they had gathered all season. Would they just die a slow starvation death? Research told me that rat style snap traps were no use because squirrels were too smart, but they were they best resource available to me. I got the beefy plastic trap made by Tom Cat, and set it on my roof with peanut butter bait. I began to work on a storm window, and a mere 5 minutes after the trap was set, I heard a “snap”. It took me a second to realize what the sound was. He flopped around a few times, and I started feeling bad that these traps weren’t strong enough to kill, and I’d have to put him out of his misery. But he died almost immediately. I was feeling pretty bad about it, even though I felt justified. But now what? 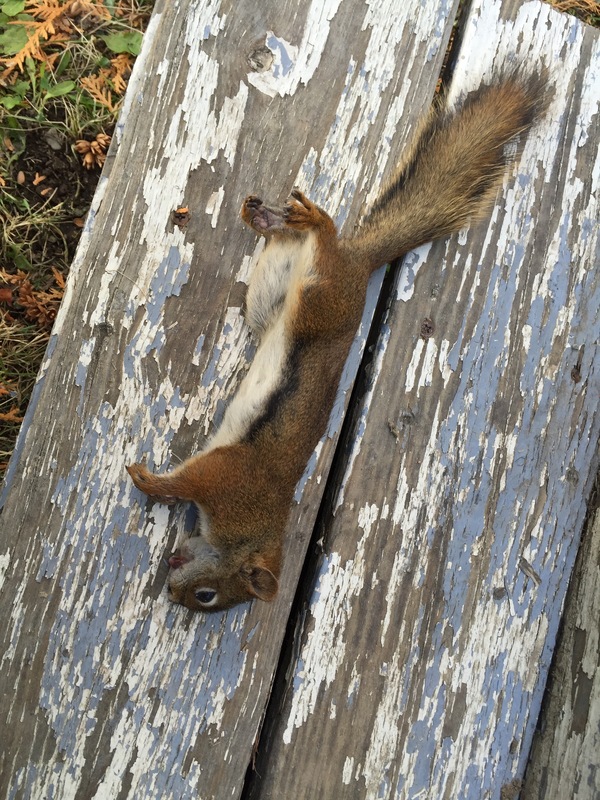 What am I supposed to do with a dead squirrel? I decided I’d feel better if I honored the animal by not wasting it. I have never ‘processed’ and animal before, so I asked the internet. 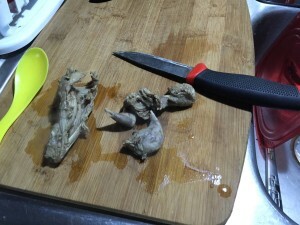 I skinned and gutted it, then boiled the meat for a while before breading and frying it. I was amazed at how good it was. What does it taste like? 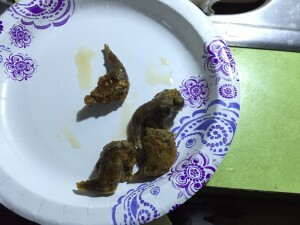 It simply tasted like the spices I breaded it with. 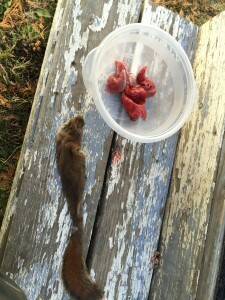 Red squirrels are small, and even though this one was big for his species, there wasn’t really enough meat for the effort it took. The next day, I opened my cabinet to get my laundry, and I was floored. It turns out, a squirrel HAD gotten in. I had recently worked a 24 hour shift, and in that time he was busy. There was a large mound of torn up paper, about 2 cu ps worth of seeds in my laundry bag and a few articles of clothing had been chewed to destruction. I suddenly wasn’t feeling so bad. My inner scientist took over and reminded me that I am a Darwinist. I get that the squirrels are just trying to survive, but so am I. In total, I caught 4 squirrels. I did not eat the other 3, because I have a fox nearby. I left the carcasses out which proved to be a good deterrent for future squirrels and after a day or two, Fantastic Mr. Fox comes around for a snack. I am planning on returning to a meat free diet very soon, but for those who choose to eat meat – I highly recommend that you take part in the killing and processing of your food at least once. There is no better way to confront the fact that a living thing has given it’s life to feed you, and to see just how much work goes into turning an animal into a meal. It really puts it all in perspective. Shawn you are so funny, articulate and smart. Love this squirrel episode. Looking forward to the next adventure. By the way Jacob Walton would love the story as well as hunting, cooking and eating the squirrel. He’s told me he’s done it and it taste like chicken. 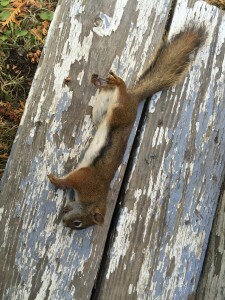 He even asked me once when I lived in Maine if he could shoot squirrels in my back yard. That Walton boy is a character and so is his twin brother, Justin. Love you Shawn.